Air China, the world largest carrier by market value, is expected to launch Beijing Airlines and Dalian Airlines in April or May. Air China is expected to launch its controlled subsidiaries Beijing Airlines and Dalian Airlines in April or May, company chairman Kong Dong said on Monday, the China Business News reported. Beijing Airlines, with a registered capital of about 1 billion yuan, will be 80 percent owned by Air China and 20 percent owned by the Beijing municipal government, Kong said earlier this month. Dalian Airlines will be jointly invested by Air China and the municipal government of northeastern China's port city of Dalian. 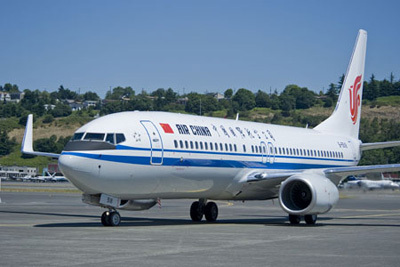 Kong also told reporters that Air China and the Henan provincial government have reached a preliminary agreement to cooperate to assist Henan Airlines in resuming normal operations. The Henan-based carrier has suspended operations since the deadly Yichun plane crash last August. Although Air China will see so many subsidiaries start operation this year, Kong said the development of Air China itself is his primary focus, specifically its growth in Shanghai and the international market. "We will step up our expansion in Shanghai in the future, mobilize Air China and its subsidiaries to win more available flight time and put more long-distance aircrafts in Shanghai," Kong said. This year, Air China plans to introduce over 30 new aircrafts, including eight to ten long-distance planes. China's business press carried the story above on Tuesday. China.org.cn has not checked the stories and does not vouch for their accuracy.